Plustek's PS286 Plus uses internal image stitching to scan A3-size documents. Imaging device manufacturer Plustek has started shipping a new portable document scanner that can handle legal and A3-sized documents. The new PS286 Plus scans documents to searchable JPG, PDF, RTF, multipage TIFF, and XLS file formats while offering a built-in image processor that automatically rotates and straightens pages, crops images, adjusts brightness, increases accuracy, and minimizes file size. The unit offers a resolution of 600 x 600, a scanning speed of 50 images per minute, a daily duty scan rate of 1,500 sheets, and nine customizable buttons, including copy, OCR, scan to file, e-mail, network share, among others. Although the scanner's normal maximum paper size is 8.5" x 14" (legal), it uses internal image stitching to scan A3-sized documents as well. 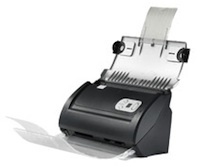 Other features include an automatic document feeder, the ability to scan ID cards up to 1.2 mm thick without adjustment, mixed batch processing, and duplex scanning (the ability scan a piece of paper on both sides by reversing the automatic document feeder). Roller life and pad life of the scanner are estimated at 100,000 scans and 20,000 scans, respectively. The PS286 Plus comes equipped with ImageFollio 4.5, an image processing software, and PageManager 7.10 for document management. Compatible with Windows 7 and Vista, the document scanner is currently available for $499. Further information is available here.